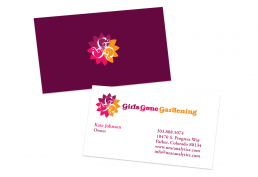 I created the logo and Corporate identity, including business cards and letterhead, for Girls Gone Gardening, a consumer gardening products supply company. The three Gs in the name lend themselves to playful typesetting. The logo reinforces the concept of growth through the use of spindly, organic type within the mark. The typography suggests femininity – part of the naming concept – and the curvy swooping characters convey a boldness that command attention.